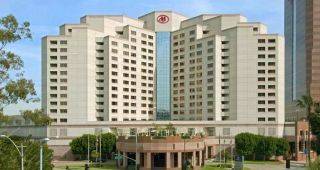 Tech & Learning's Tech Forum California will take place at the Hilton Long Beach in Long Beach, CA (L.A. County) on Friday, January 17, 2014.We have arranged for preferred hotel rates for Tech Forum participants. When making reservations, be sure to mention that you are attending Tech Forum California for correct group block booking and a special room rate of $169.00 (single or double occupancy, plus applicable tax) per night. Deadline: January 3, 2014. Relax in the warm and inviting atmosphere of Hilton Long Beach, located adjacent to the World Trade Center. Excellent business amenities and its location one mile from the beach make it an excellent choice for business travelers and vacationing families alike. Take advantage of its superb location in the center of the business district and central to the Convention Center, Long Beach Aquarium of the Pacific, the Queen Mary, Port of Long Beach and Southern California's best beaches.